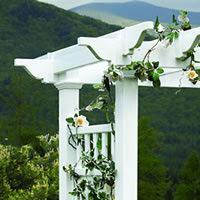 Arbors can be the best and investments for the appearance of your garden or to set off your wedding. Choosing the right arbor for you can be a difficult decision, but it’s easier than you think. First there are different materials such as metal, vinyl and wood. Each one will be sufficient. Your main concern is the purpose and the look you are going for. Vinyl Arbors are not only great for growing vines; they are the most popular in use at weddings or just in a yard to show its beauty. Vinyl Arbors not only have the look of wood, they are actually one of the most durable and require the least maintenance. They will be bigger and most likely heavier than most metal arbors. Most of them even have a lifetime warranty. They never need painting, staining, or sealing to keep their exceptional good looks. They won't fade or yellow and have been field proven to maintain their color. Also, they will not crack, split, warp or peel like wood or corrode like metal arbors. There are many different styles to fit the different needs of everyone’s taste. Some of them are available with trim or without trim. If you’re not sure about "arbor talk" you may not know what exactly this is. Trim is actually an accent that goes on the top and bottom of the poles; pretty much an extra decoration. There are many different styles and sizes of Vinyl Arbors from a simple arch to pergola style; narrow path to wide path and also to an arbor with gate and wings. Mounting the vinyl arbors can be a very simple process as well. The mounting process is very similar as those made of metal; the only difference is the post is larger. Most of the vinyl arbors will have 4x4 or 2x2 post in which you would need a 4x4 or 2x2 post or augers for mounting. We have a no dig auger system that will be the easiest option to choose from. 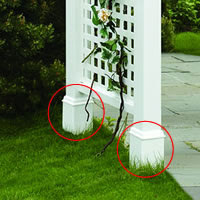 No digging means a faster, cleaner and easier way to install your arbor than you ever thought possible. In other words, leave your shovel and wheelbarrow in the garage, no need for concrete, either! The No Dig-Perfect Post Mount System is the ideal solution to save you time and unnecessary stress. Just add this product to your order and it will be shipped with your Arbor or simply hit check out if you prefer to install your arbor another way! You would select the In-Ground Systems which work great on grass, clay, or soil or Surface mount systems which are for concrete pats or patios. 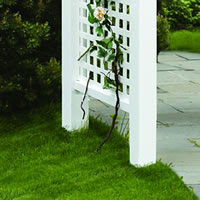 The posts are 1 1/2" diameter x 20" Galvanized Steel and for an arbor system you would need the set of 4 mounting augers.